Electronics on the Dinner Menu! We all know today’s dinner scene may look very different from the pre-tablet and smartphone age – recently, I was at breakfast with my family and niece and we each had a device. 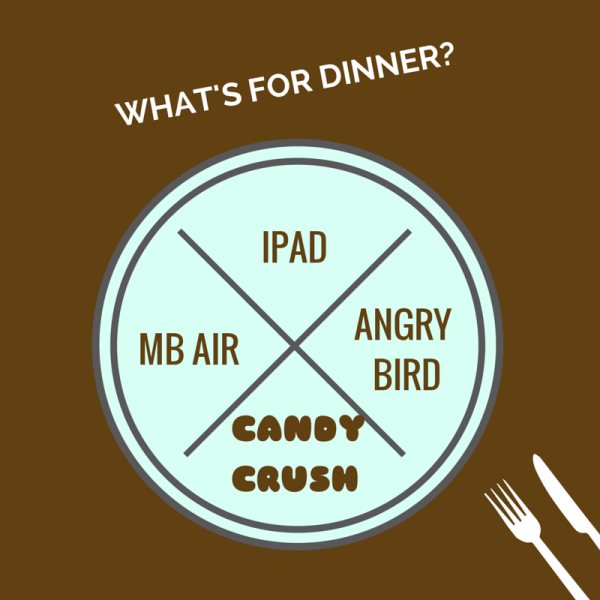 I immediately thought of all the parenting advice that I am to practice – remove electronic device, build conversation and open our world to each other during meals (vs closed up and only pals with Angry Birds, crushing candy). But then I thought – hey, it’s also a way of connecting. It is possible that conversations can be built around how to crush candy, your best score, highest level and longest time to break one level. Why not? If it’s something that at that point works to draw people closer, it’s more than justified. Jesus was unconventional in drawing people together – he talked to a samaritan woman at the well (John 4) and ate with tax collectors in their home (Mark 2:13). Talking about eczema draws parents of eczema kids closer too – hopefully, this blog helped in that conversation! I do pray that we all have time to enjoy our meal, with friends and family (despite it being so stressful with the eczema!). God, we thank you that you are a God who loves people, dine with us and meet us at the most unlikely place but just when we need it.